Angled shaft, 10mm from bend to tip, blunt tip, triangle-shaped cutting edge. Ambidextrous use, round handle. 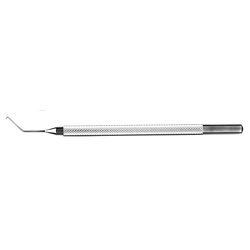 Overall length: 115mm.